After getting the permission to guard Toramatsu, II Naotora faces a problem of producing commercial crop. Then SETO Hokyu shows her raw cotton and cotton cloth that is softer and more excellent in warmth-keeping than linen. He says that cotton will be popular in the near future and recommends cultivating cotton to her. She offers the farmers of Seto includes Jinbei to grow it but it's hard to do it perfectly by themselves. ONO Tajimanokami Masatsugu rerturns to Ii-no-ya and hands her note that she accepts that Toranatsu should be under the guardianship of Masatsugu. Shino is still unwilling to accept Naotora but he tells her not to oppose her surroundings. And he is welcomed by Natsu and Inosuke in his house. It seems that Inosuke and Toramatsu are on good terms. Masatsugu tells his sister-in-law that staying in the house will make her feel oppressed but she says it means that he is zealous in the discharge of his duties (**). Naotora goes around her territory to ask for farmers to grow cotton but in vain. When she and NAKANO Naoyuki,who accompanies her take a rest, she goes to a waterfall to fill her water bottle (***) with water and finds a strange man there. He who takes the downfall says he's in the middle of a trip and then wears a gaudy kimono. She tells him that she searches who helps her new agriculture. "If you want somebody who helps you, you can buy them," says he. She is surprised to know about human trafficking and asks Hokyu about it and knows that people are often sold near battlefield. Hokyu takes her to his teahouse where many passengers exchange information. On the other hand, ONO Tajimanokami Masatsugu is left in the cold about this matter. But he wonders why she ofter goes out with Naoyuki or Rokuzaemon and researches where she goes to. At last he hears that she searches farmers from a senior priest of Hachisaki Shrine. 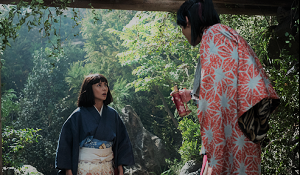 Naotora and Naoyuki visit Hokyu's teahouse and see an unexpected man. It is Ono Masatsugu who has a cup pf tea. He tells them to spread rumours here where passengers gather and take a rest. Then Hokyu speaks about the cotton cultivation in Ii-no-ya loudly. In the course of his conversation, everyone sing his words in chorus and liven up the atmosphere. Some people who listen to the song ask Naoyuki how to access to Ii-no-ya and depart for there. After returning to the residence of the Iis, Naotora is so exhausted and faints. She keeps sleeping and her mother Yuchinni says that she's like a child play too much and get tired. However, in Sunpu, a faint of a woman is going to change the power relationship of daimyos. Jukeini falls down and takes to her bed though she is saved from death. Naotora wakes up on the next morning and finds many people visit the residence to apply the job of growing cotton. She is pleased but it is owing to the idea of Masatsugu. She consults Nankei whether she should leave guarding Toramatsu to Masatsugu or not. Nankei says if she does so, the Onos will rule Ii-no-ya. After that Toramatsu leaves his mother Shino and is to be educated at Ryotanji Temple. And Naoyuki who worries about the future of the Iis shows his lady lord a matchlock called Tanegashima in Japan. (*) Prpbably the title is based "Akage no an", Japanese title of "Anne of Green Gables". (**) Natsu is well aware that her brother-in-law dares to behave to be disliked by Naotora for the purpose of guarding the Ii clan. 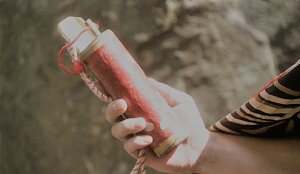 (***) At that time, water bottle was made of bamboo as you can see in the image. Today I run over the main points of my posts concerning the series of Taiga Drama. "Onna Joshu Naotora" is the series that is being broadcast this year. This is set in the 16th century Totomi, current western part of Shizuoka and describes the decline and the reconstruction of the Ii clan, especially the life of II Naotora who guards her adoptive son Toramatsu, later II Naomasa. At present, it describes the domestic administration of Naotora with her vassals and advisers rather than battles. "Sanada Maru" was broadcast in 2016. It describes the life of SANADA Nobushige (Yukimura). He was born as the second son of Sanada Masayuki, becomes a hostage to the Uesugi clan and then serves TOYOTOMI Hideyoshi. After the Battle of Sekigahara, he is exiled to Kudoyama in Kii, current Wakayama but escapes there to participate in the Siege of Osaka. In the winter campain, he achieves a brilliant exploit by winning the Battle of Sanadamaru. Not only the description of Nobushige, but also that of Masayuki gained popularity. "Furin Kazan" is the series broadcast in 2007. 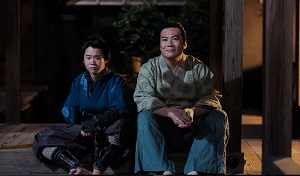 It is based on the novel written by Yasushi Inoue that features YAMAMOTO Kansuke, strategist of TAKEDA Shingen. As the series is full of battle scenes, sword fights, conspiracies and tough and manly characters, it is strongly supported by many men. At first 48 episodes were to be produced but one episode was added at the request of viewers. Personally, "Furin Kazan" reminds me of "Sharpe" produced by ITV. The images are from the official websites of "Onna Joshu Naotora" and "Sanada Maru", and a DVD of "Furin Kazan". YAMAMOTO Kansuke was a strategist of TAKEDA Harunobu (Shingen) but was considered to be a character in legend for a long time. He was born in Ushikubo, Mikawa (current Toyokawa City of Aichi Prefecture) and was adopted by OBAYASHI Kanzaemon in his childhood. He traveled many provinces to perfect his skill of swordsmanship in his twenties, and tried to serve IMAGAWA Yoshimoto but was rejected for him being one-eyed and lame in one leg. But he kept staying in Suruga, territory of the Imagawas. After that he was recommended to serve TAKEDA Harunobu, later Shingen by ITAGAKI Nobukata, one of the senior vassals of the Takedas. He participated in many battles and built Kaizu Castle, later Matsuhiro Castle. During the fourth campaign of the Battle of Kawanakajima, he was attacked by the soldiers of UESUGI Masatora (Kenshin) and died in the battle. He emphasised that a daughter of SUWA Yorishige should become a concubine of Harunobu after the fall of the Suwas and then they had a son called Katsuyori. Besides he contracted a friendship with SANADA Yukitaka, father of Sanada Masayuki and grandfather of Sanada Nobuyuki and Nobushige. 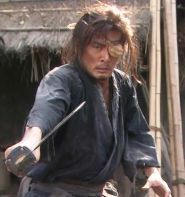 In this series, he is described as a kind of vagabond but a master swordsman. He meets a girl called Mitsu in Kai but she was killed by Takeda Nobutora, father of Harunobu. He hates Nobutora so much but decides to serve his son Harunobu who exiles his father to Suruga. After becoming the strategist of TAKEDA Harunobu, he displays his abilities though opposed by some senior vassals and maneuvers other clan. Later he becomes to be accepeted but was shot in the Siege of Kawagoe Castle and saved by Sanada Yukitaka. Then Yukitaka and other rulers of Northern Shinano serve Harubobu. On the other hand, he is secretly in love with Yu-u hime and mourns her early death. 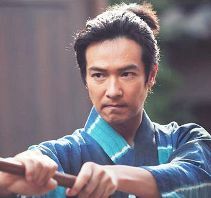 The image shows Seiyo Uchino as Yamamoto Kansuke. 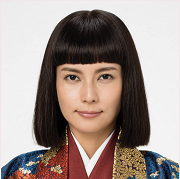 MUROGA Masatake was one of the rulers of Northern Shinano (current Nagano) and served MORI Nagayoshi, one of the vassals of ODA Nobunaga after the fall of the Takeda clan. After Nobunaga was killed in the Honnoji Temple, the local rulers in Northern Shinano includes his rival SANADA Masayuki served the Hojo clan but he didn't. In 1583, he fought over the territory against Masayuki. Though they became reconciled to each other, he communicated secretly with TOKUGAWA Ieyasu and was ordered to kill Masayuki. 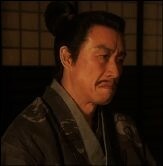 But on the contrary, he was betrayed by his vassal and killed by Masayuki in Ueda Castle. His brothers served Ieyasu later. He is proposed to rule both Shinano and Kozuke (current Gunma) by local rulers only and agrees with him but becomes to oppose him who actually leads the rulers. HONDA Masanobu, who intends to assasinate Masayuki advises his lord Tokugawa Ieyasu to win Masatake over to his side. 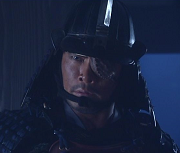 On the day of the wedding of SANADA Nobushige and Ume, he is killed by Masayuki who forestalls him and IDEURA Masasuke. （*）The words become very popular in Japan.